Dr. Stephen Strange (Benedict Cumberbatch) is a wealthy and arrogant neurosurgeon in New York City. After a car crash, he seriously injures his hands, so he can never operate again. Dr. Strange desperately tries to heal his hands by experimental surgeries which all fail, and he nearly bankrupts himself by finding a solution. He even pushes away the one friend he has, surgeon and former lover Christine Palmer (Rachel McAdams). Since Dr. Strange himself is a New York City native, many sights from the film can be spotted on the NYC TV & Movie Tour and the Super Tour of NYC. When everything fails, he learns about Jonathan Pangborn (Benjamin Bratt). Jonathan couldn’t use his legs anymore, but mysteriously walks again. Jonathan says Dr. Strange has to go to Kamar-Taj to find what he is looking for. Dr. Strange leaves everything behind and is taken in by Mordo (Chiwetel Ejiofor), who guides him to the Ancient One (Tilda Swinton). She shows Dr. Strange her powers and unveils the Mirror Dimension. She agrees to help Dr. Strange by training him and helping him find what he is looking for. Dr. 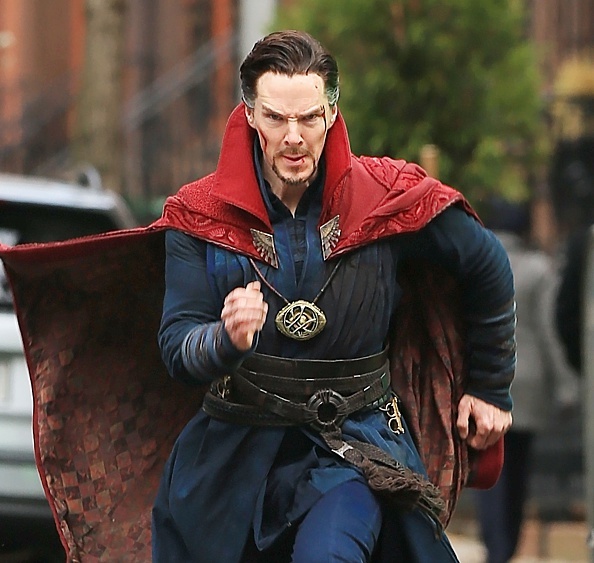 Strange is eager to learn, and during his study he tries to read as many books as he can in the library of Kamar-Taj, protected by Master Wong (Benedict Wong). He learns that the earth is protected by Sanctums, and one of these is located in New York City. Dr. Strange’s studies progress quickly and he learns that Kaecilius (Mads Mikkelsen) wants to destroy the world with the mystical Eye of Agamotto. When Kaecilius destroys the Sanctum in London, Dr. Strange has to defend the New York Sanctum. Dr. Strange’s luxurious brand new apartment at 535 West End Avenue at West 86th Street, on Manhattan’s prestigious Upper West Side. When Dr. Strange stumbles through one of the “dimensional doors” inside of the Sanctum, he falls on 177A Bleecker Street, which is the address in the comics. However, there are no cobblestones in Bleecker street as this part is actually filmed on 12th Street at the southeast corner of West 4th Street in Greenwich Village. During his battle with Kaecilius, Strange crashes through the roof of the Bank of America Financial Center, which you can see on the NYC TV & Movie Tour.